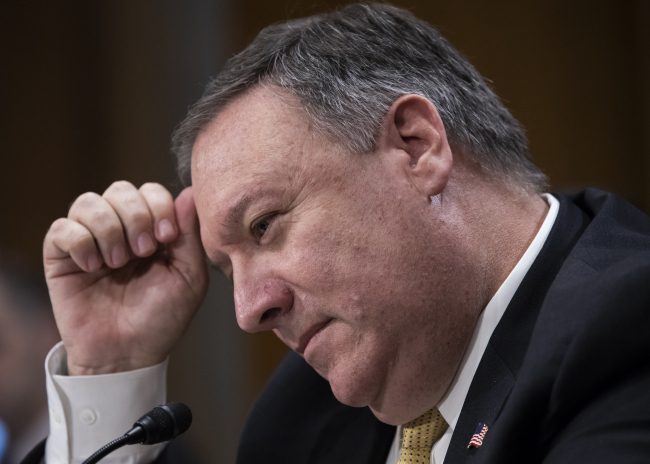 US Secretary of State Mike Pompeo said Friday his country remains committed to dialogue with North Korea despite President Donald Trump's decision to call off his summit talks with the communist nation's leader next month, according to Seoul's foreign ministry. Pompeo made the remarks in his phone conversation with Foreign Minister Kang Kyung-wha to exchange views on related situations and coordinate a strategy. The secretary briefing Kang in detail on the background of Trump's move and also stressed the US has a "clear will" for continued dialogue with the North, the ministry said in a press release. They agreed to continue efforts to create conditions for talks between Pyongyang and Washington, it added. The minister, especially, emphasized the need to keep the momentum from the inter-Korean summit in April and the opportunity for negotiations between North Korea and the US alive. She pointed out that Trump left the door open for talks in his public letter to the North's leader Kim Jong-un, as the top diplomats discussed "various ways" to maintain the dialogue phase. Trump tweeted, "I have decided to terminate the planned Summit in Singapore on June 12th. While many things can happen and a great opportunity lies ahead potentially, I believe that this is a tremendous setback for North Korea and indeed a setback for the world..."
In the letter released earlier, however, he told Kim, "If you change your mind having to do with this most important summit, please do not hesitate to call me or write." Kang and Pompeo also discussed the North's latest statement issued by a senior diplomat, noting it reflects the country's unrelenting hopes of a summit with the US and determination to continue dialogue, the ministry added. In an unusually quick reply, North Korean Vice Foreign Minister Kim Kye-gwan said early Friday morning that his country is still willing to give the US "time and opportunities" to talk anytime and in any form. With the statement, carried by Pyongyang's state-run Korean Central News Agency, the North passed the ball back to Trump. There are more than two weeks before the agreed-upon summit day. The two sides may reschedule a summit, depending on situations going forward.